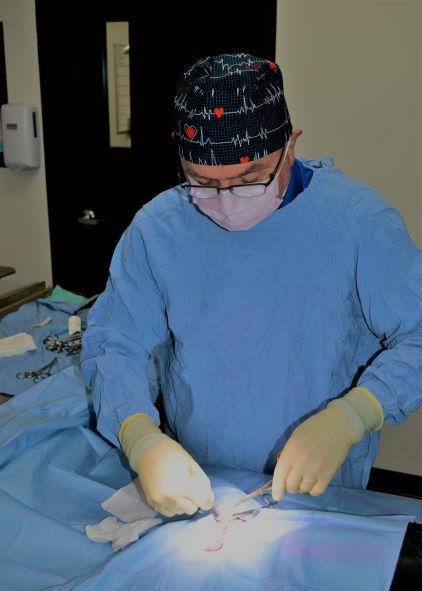 Our doctors perform a variety of surgical procedures including spays, neuters, bladder stone removals, growth removals, and more. We realize that surgery can be a stressful event for you and your pet. Rest assured that we will do all we can to ease your mind and provide a comfortable environment for your pet. We will take extensive measures to ensure the safety and well-being of your pet and give every opportunity for a successful outcome. Before surgery, you and your pet will meet with the technician or doctor to answer any questions you have and to verify the procedures being performed. We will go over the procedures, let you know approximately when your pet will be done with surgery, and set up a discharge time for later in the day. The doctor will preform a thorough examination. He/She will check your pet from head to toe to make sure your pet will be safe under anesthesia. Blood work will be done to evaluate your pet's organ function. This will help us select an anesthetic protocol for your pet and alert us to any health concerns. A sedating medication will be administered to your pet to allow him/her to relax and to lessen the amount of gas anesthesia that will be needed during surgery (making it safer for your pet). We will place an IV catheter in your pets leg. The catheter will stay in place before, during, and after surgery and will provide emergency vein access if needed. It also allows us to administer IV fluids to help maintain blood pressure during surgery. Your pet will be given a medication to induce full anesthesia and allow us to place a breathing tube down the trachea (windpipe). During surgery, your pets vital signs will be monitored closely by a veterinary technician. A monitor will be attached to your pet that constantly reads heart rate, ECG, respiratory rate, temperature, the amount of oxygen in the blood, and blood pressure. Your pet's body temperature is controlled during the whole procedure. Hypothermia can slow the heart, causing complications and slowing the recovery process. We use a warming device paired with warm IV fluids, blankets, and towels. Once the surgical procedure is complete, a technician will stay with your pet until he/she is awake and recovered. The technician will call you to let you know when your pet is awake and will send a picture of your pet and an update in the afternoon. When your pet is discharged, the veterinarian will speak with you about the procedure and go over any necessary home care for the recovery process. The following day, you will receive a call from our off to check on your pet. If you have concerns, the doctor will be happy to speak with you. If you have additional questions about surgery for your pet, please contact us by phone or in person.